Today's ink is Montblanc The Beatles, Psychedelic Purple. It's a new limited edition ink for this year, released alongside a new limited edition Beatles pen. Since the name of this ink is pretty long, for the purpose of this review, I'm just going to call it the Beatles. Anderson Pens was very kind to send me a sample of this ink so I could review it-it's not usually sold in samples. Beatles is a medium bright purple with some gold sheen. I think this is a good summery purple. There is some nice gold sheen on the edges of pooled ink. Bleeding: Low-there was some bleeding in the flex nib on all of the papers. On 20 pound copy paper, there was a little bit of bleeding, like there was on the other papers, and a little bit of feathering as well. 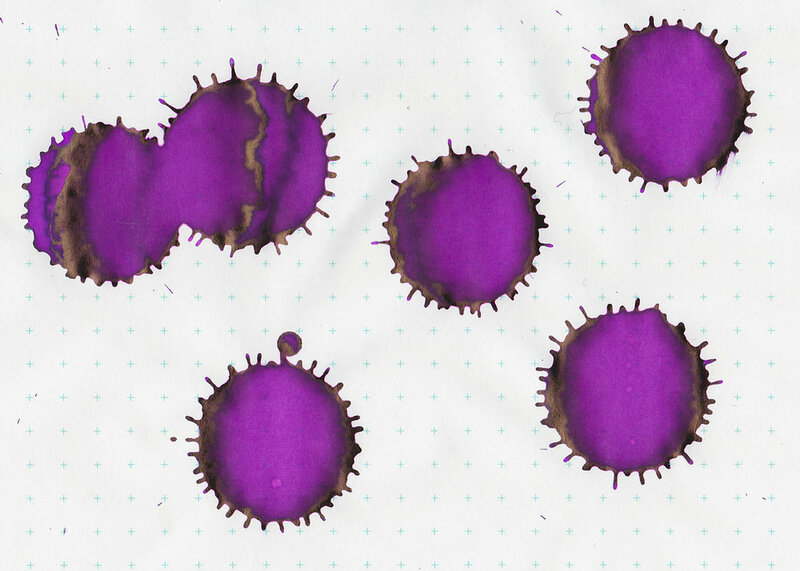 Ink swabs for comparison, left to right (top to bottom for mobile RSS): Cross Violet, Montblanc Beatles, and Lamy Dark Lilac. Click here to see the Montblanc inks together. Violet and Beatles look very similar to me, but Violet has a green sheen while Beatles has gold sheen. 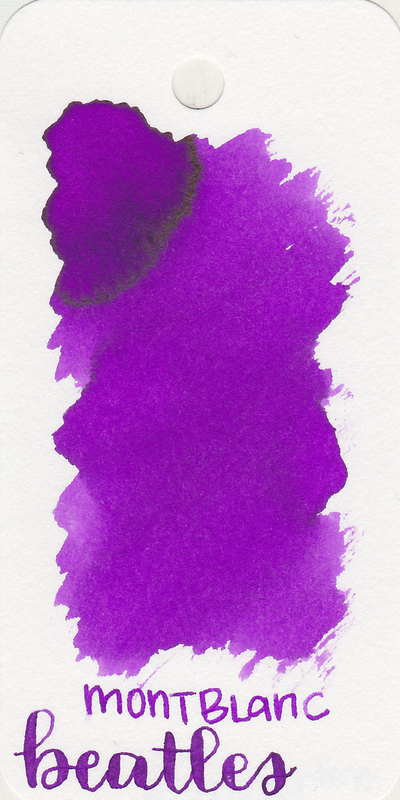 Dark Lilac has gold sheen like Beatles, but it has medium shading and sheen and is a little darker, while Beatles only has low shading and sheen. If you missed out on Dark Lilac, Beatles might be a good alternative for you, and would probably be cheaper than buying a bottle on eBay. Diamine Purple Dream, Waterman Tender Purple, and Diamine Grape. Click here to see the purple inks together. I used a medium Pelikan m605 White Transparent on Leuchtturm paper. I really liked this pen/ink combo-really smooth. The ink had an average flow. One other thing I want to mention is cost-this ink is $43 which works out to $0.86 per ml. For comparison, Robert Oster ink works out to $0.34 per ml. Just something to consider, however, Montblanc inks come in really beautiful glass bottles. Overall, it's pretty well behaved, and is a really nice color. I wish it had a bit more shading and sheen. I do think the ink is really pricey per ml. Disclaimer: This ink sample was provided to me by Anderson Pens, for the purpose of this review. All photos and opinions are my own. There are no affiliate links on this page.